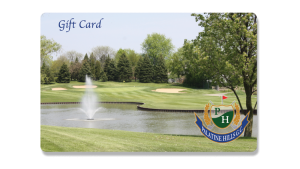 Palatine Park District gift cards are now available – and just in time for the Holidays! Gift cards are only available for purchase in person at Birchwood Recreation Center, Community Center, Falcon Park Recreation Center, and Palatine Stables. Please Note: Palatine Park District gift cards are redeemable for the purchase of programs, passes, or memberships. Gift card must be presented for payment at time of purchase; card must be present to access account. The available card balance will be applied toward your purchase. All prices are subject to change without notice. Cards cannot be redeemed for cash, and change will not be given. Value can be added to the card at any time. Available balance will print on the receipt and will remain on the card until used. Gift cards do not have any value until activated and gift cards do not expire. Palatine Park District is not responsible for lost, stolen, damaged, or unauthorized use of this card. Lost or stolen cards will not be replaced. 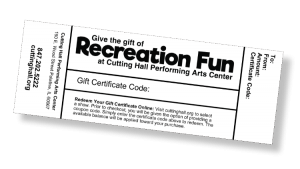 Palatine Park District gift cards cannot be used for purchases at Palatine Hills Golf Course, Cutting Hall Performing Arts Center, Health and Recreation Center at Harper College, or pool concession stands. View additional gift certificate options below.